Architecture studio Taller Paralelo has overhauled an abandoned building in Mexico City to create this residence, which is arranged around a courtyard with a reflective pool. The intervention revitalised a building from the 1960s, located in the Lomas de Chapultepec neighbourhood. Despite its poor state, the structure was salvageable, according to the Mexico City-based studio. "The main idea of the project was to take advantage of most of the structural elements of the original house to make it profitable," said the firm, which is led by César Flores and Mikel Merodio, in a project description. The original structure was built in a split-level configuration, which Taller Paralelo has preserved in their intervention. This means Cachai House comprises three floors that are staggered, with the different levels connected via shorter staircases. A standout feature of the project is the entry courtyard on the ground floor, which features a reflective pool wrapped by board-marked concrete walls and slatted screens. Also on this level, Taller Paralelo has included a multi-functional den to be used as a movie room or guest suite. It is accessible without entering the home to it offer guests more privacy. Concrete stairs cantilevered from the board-marked concrete wall lead from the outdoor space to a garden above, and the main home. Living spaces occupy the first floor and include a formal foyer, and a lounge that opens onto a terrace. There is also a small garden featuring a Japanese Guava tree. The family's kitchen, living, and dining room occupy the eastern side on the second level. A half level up leads to the children's bedrooms, which face the garden and enjoy a shared balcony – one of a series included in the residence. "Terraces play a very important role so that each space has a real connection with the outside; taking advantage of the context," said Taller Paralelo. The top two levels are for the couple. Their bedroom, bathroom, and closet are on one side, while the other half level contains a study and a lounging terrace. Taller Paralelo used a limited range of materials for the renovation, giving the home a minimalist aesthetic. Exterior walls are mostly rendered in white, with some concrete elements visible throughout the home. Wooden louvres are used for accent walls, skylights, and shutters, and help to bring warmth to the neutral palette. Other materials include textured tiles for the rooftop terrace and the black steel staircase that runs up through the centre of the home. 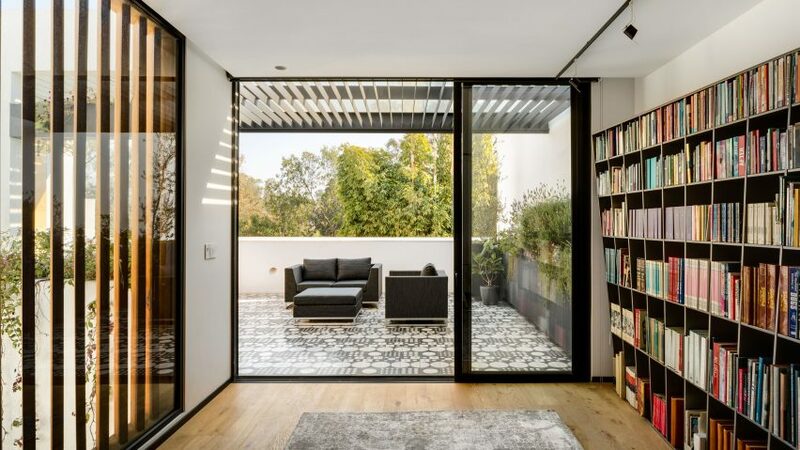 Mexico City is experiencing a boom in architecture, with standout residential projects including an Aztec-influenced beach house and a residence comprising several black concrete volumes.